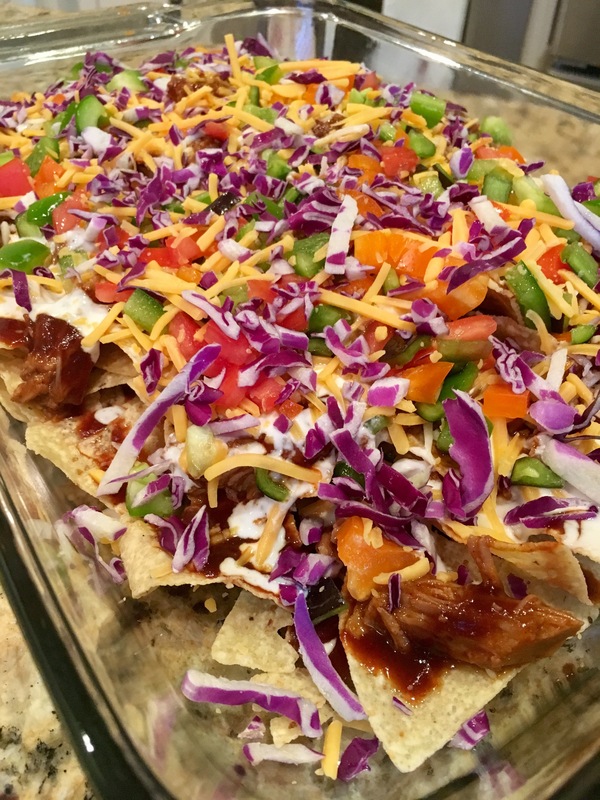 BBQ Pork Nachos – Eat, Drink, and Go! I couldn’t recall if I’ve written about these in the past, but since they’re so good, I erred on the side of repetition. Hope you don’t mind!! They’re so easy. 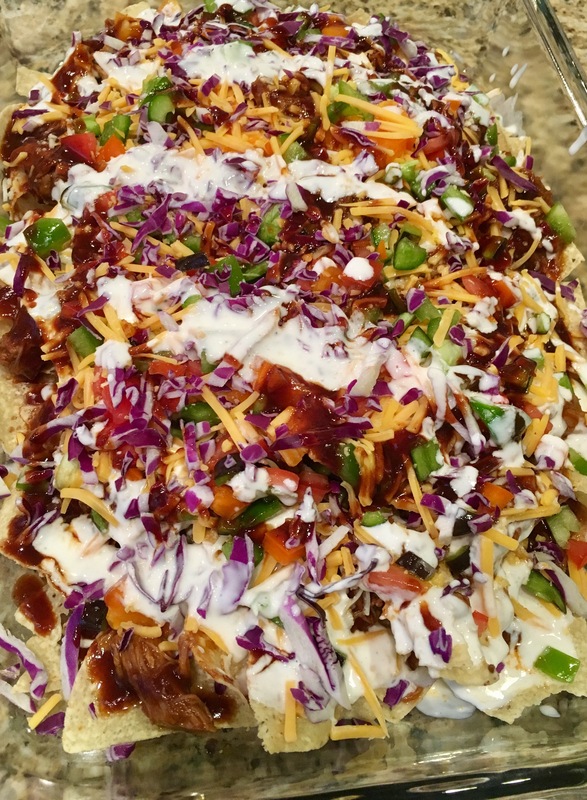 If you can’t make nachos, you probably don’t read my blog. 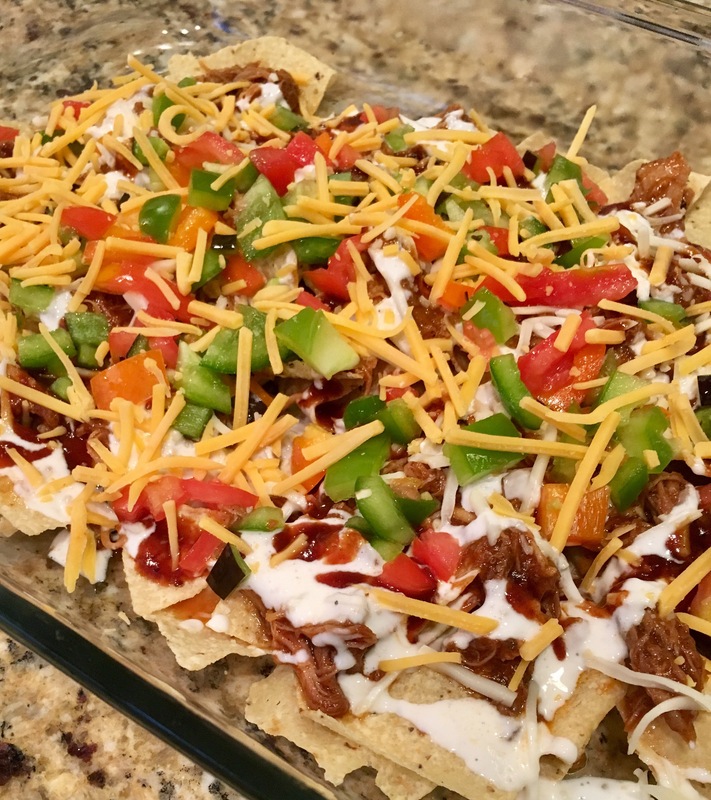 But this is for the idea of BBQ style nachos if you’ve never tried them, because it’s a great change up from the traditional Mexican varieties. 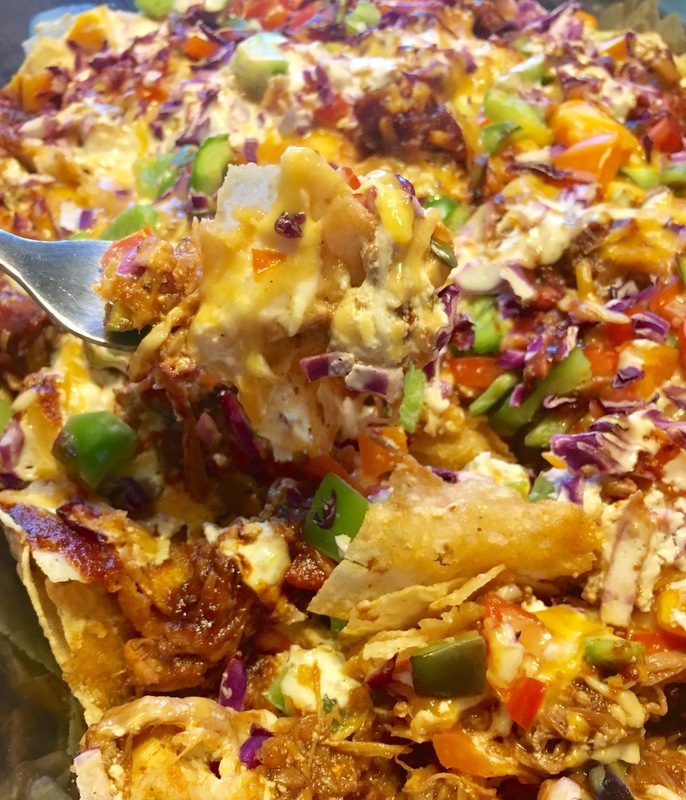 I don’t think you can’t make nachos. BBQ pork nachos first happened on a family trip when I had a bunch of BBQ pulled pork leftover, some tortilla chips, and plenty of cheese. I’ve recreated it a couple times and it’s just delicious. 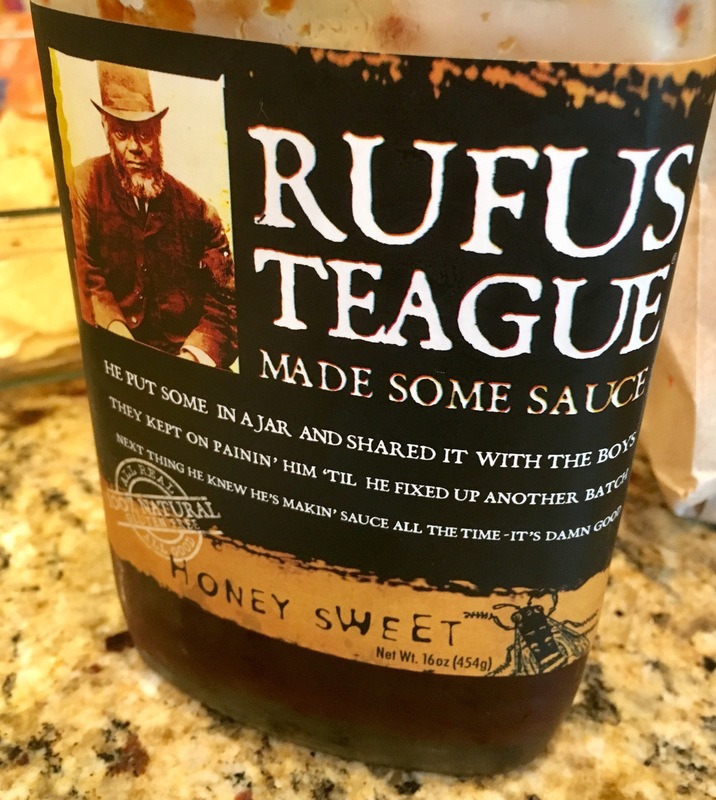 I had a different BBQ sauce this time (usually it’s Sweet Baby Ray’s) which is nice and smokey sweet – Rufus Teague. 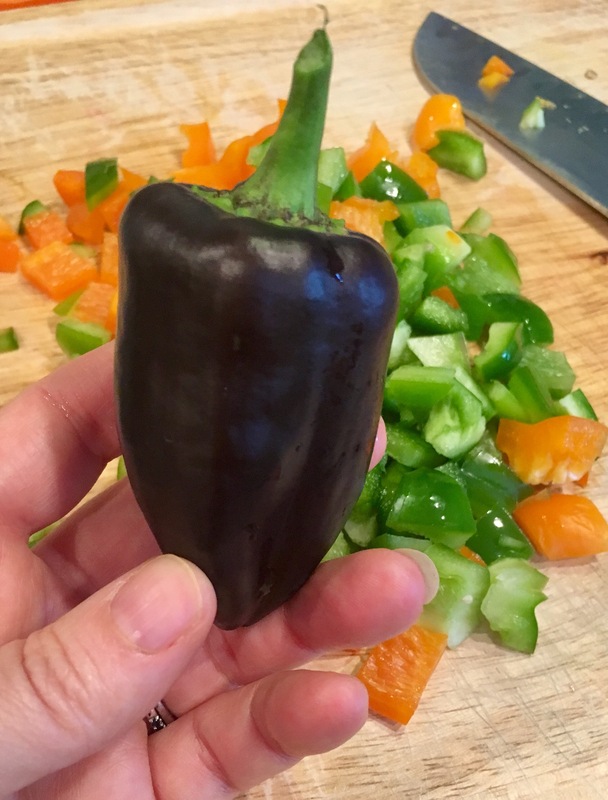 I also had some peppers from the garden – they finally started coming in pretty late in the season. And some are purple!! No, they’re not actually purple inside, unfortunately. 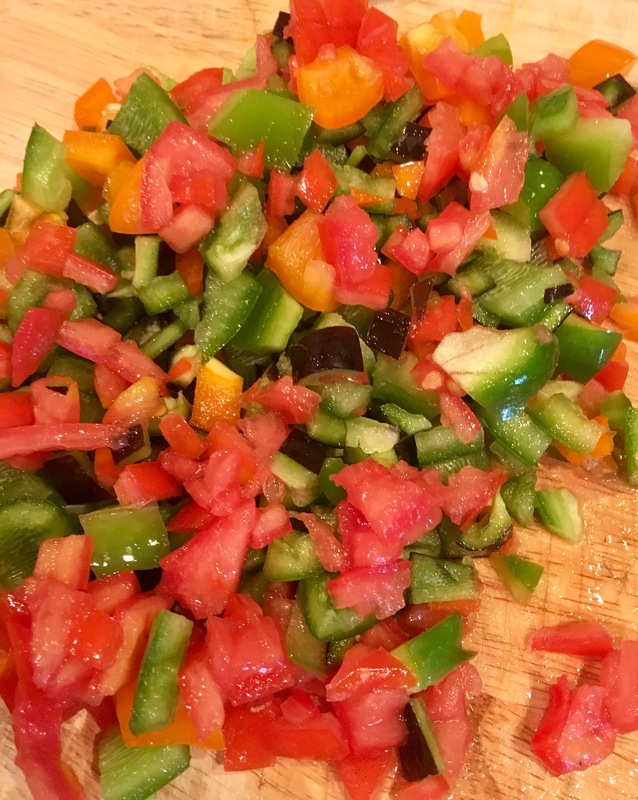 I diced up the purple peppers with a green and an orange one for color, then added in some tomatoes from the garden. 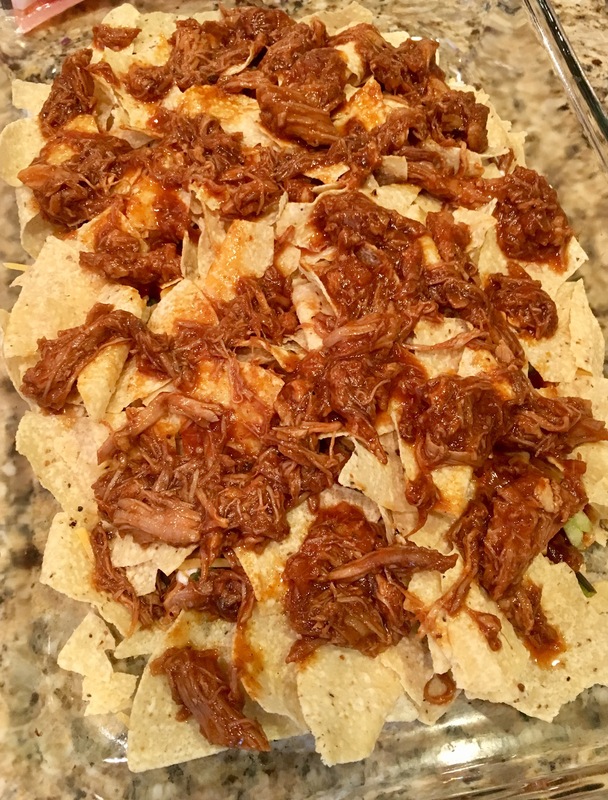 Obviously the key ingredient to pork nachos is the pork and each time, I’ve used leftover pulled pork. I always have leftover when I make pulled pork because there’s no point in slow cooking anything smaller than 8 pounds of meat. 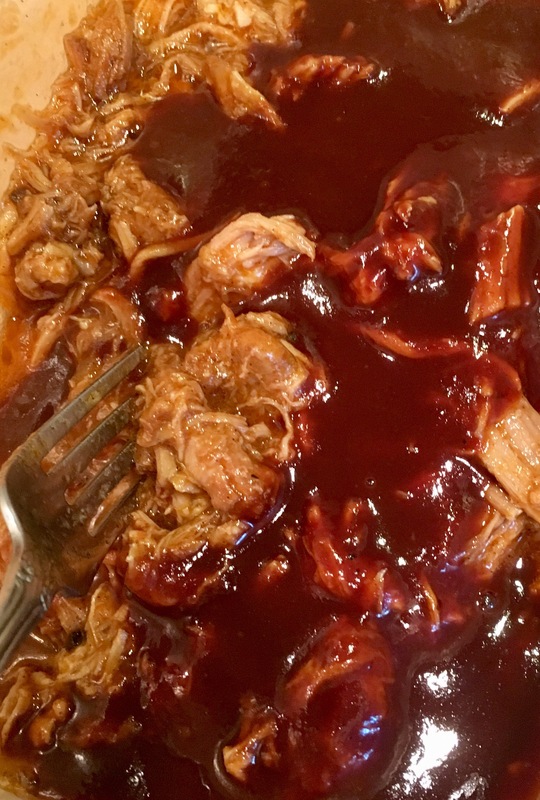 I shredded up the pork a bit more and added more BBQ sauce. Then I started the layering! You want to lay down a bed of chips – chips that are sturdy enough to maintain their crisp. Add on a layer of the pork and some cheese. I used a combo of mozzarella and cheddar. Then add half of the peppers and tomatoes, more cheese, and drizzle on some BBQ sauce and some blue cheese dressing (if you have blue cheese chunks, add them too). 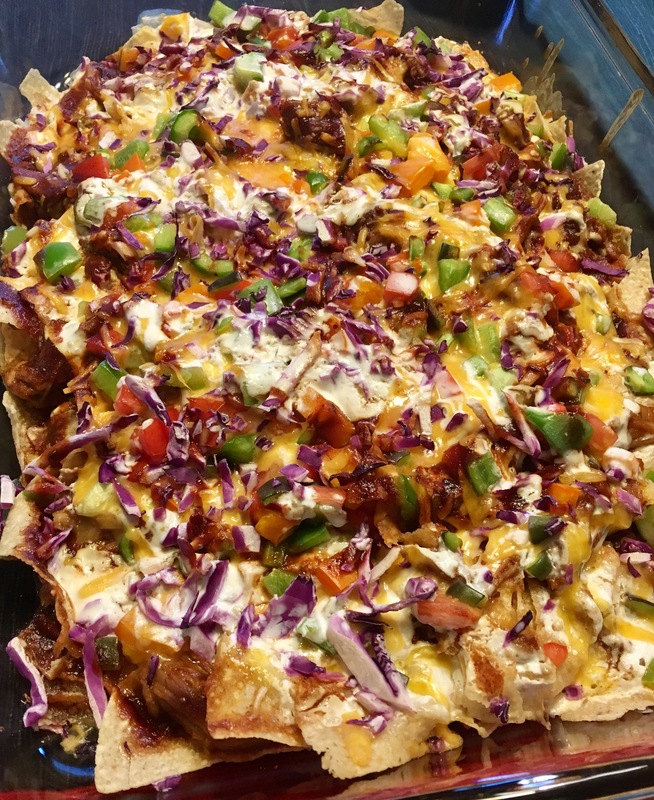 Nachos are really free form, so feel free to be creative. Then for later two, use another layer of chips, the rest of the meat, then keep piling. I added on the rest of the peppers and tomatoes, more cheddar and mozzarella, more BBQ sauce and some red cabbage for crunch and color. Before popping in the oven, I drizzled on a little more BBQ sauce and splashed some blue cheese dressing on top. There is no rule on the number of layers. Toss in the oven. Bake til all is melty and ta-da!! 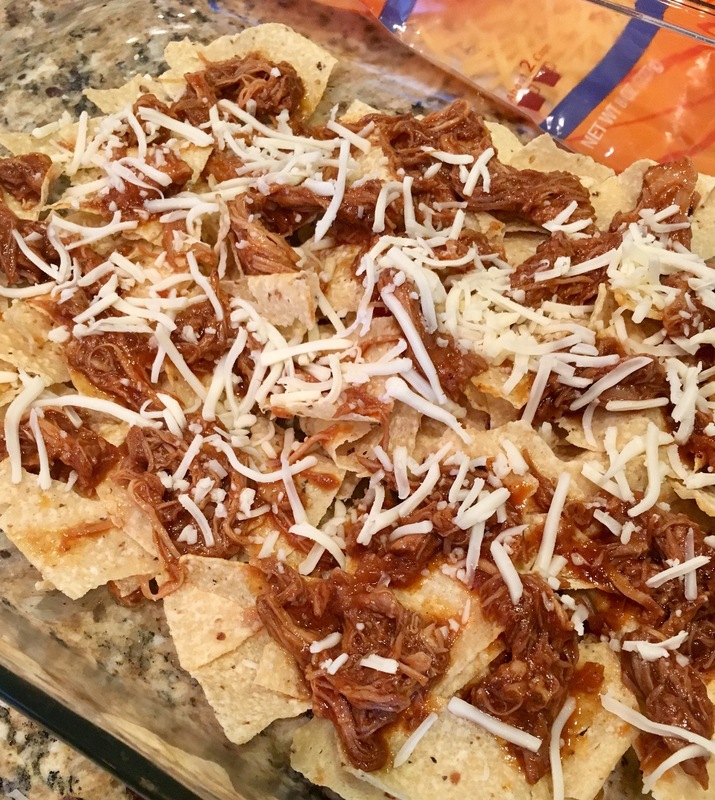 Pork nachos! !